In the middle of nowhere, east of East Williamsburg, officially Ridgewood but not really, near the terminus of the Newtown Creek, across the road from an auto salvage yard and just up the road from the NYC Transit Authority is Bun-ker Vietnamese Restaurant, the new center of my universe. The place is tacky enough to be incredibly real as only a restaurant started on a shoestring by two brothers can be. (The out of the way location was to have been a seafood distribution center, but Sandy put an end to that dream.) The walls are covered with bamboo covered wainscoting, little toy soldiers line the window trim and utensils are in aluminum cans on the vinyl tablecloth covered tables, whose benches are made from skateboards and other found wood. If you want filtered water you are welcome to get up and get it yourself from the big orange cooler on the table by the door. The message is clear – this place is not about the decor. It’s about the food. And that food is incredible. Crab chips – spicy, light and perfectly accompanied by lime aid with Chia seeds. Summer Rolls – Shrimp, Pork and Vermicelli. Light, delicious, with fresh basil and a great dipping sauce. Grilled Eggplant with Vermicelli, basil, peanuts, cucumber and roast tomatoes with a light rice wine-fish sauce dressing. Even I, the eggplant non-lover, loved it. Coconut braised Duroc short ribs. (Duroc are a breed of pigs, and these were antibiotic-free, pasture and humanely raised.) Literally falling off the bone. Tomato Fried Rice – The perfectly softened garlic clove alone would have been enough. Ca Ri Ga. The best chicken curry OF MY LIFE, made with lemongrass and coconut, potatoes, and carrots and served with perfectly cooked Roti pancakes for mopping up the sauce. Total tab including tip for this, two lime aids and two vietnames Iced Coffees was $92, which fed 5 of us with ribs leftover to take home. As we were leaving, past the line of patrons standing outside in the rain waiting for a table, Mason was scheming how she would get back for lunch tomorrow. Unfortunately, Mason,Bun-Ker is only open for dinner during the week, but does serve lunch on weekends. Arrive early if you want to get a table without a long wait. We’re not the first ones to find Bun-Ker – The NY Times, Wall Street Journal, and NY Magazine, among others, beat us to it. Sometimes it’s fun to act like a tourist and see your home through fresh eyes. That’s what we did yesterday, when we joined a Manhattan Walking Tour of the West Village that had tempted us with a great low-price offer on Gilt City. Blessed with unseasonably warm weather, the company of good friends and a fabulous tour guide, we spent a leisurely 2 hours or so wandering through charming streets, learning a bit of history, architecture, fun facts and neighborhood gossip while sampling the unique culinary offerings of one of my favorite neighborhoods in New York. Did you know that the reason the streets of the Village are so circuitous is because they followed the paths of stereams? And that those streams still can be heard running uner the streets? Minetta Lane is one such street. (Here’s a fabulous blog post I found about a building with a tube that dips down into the Minetta stream and fills with water whenever the stream rises. Read the comments section of the post for more underground Manhattan steam stories). Hudson Street is named appropriately, since it used to run alongside the river. After decades of landfill along the west and south sides of Manhattan, however, Hudson St now runs three blocks inland. You see more sky in the Village, where there are fewer tall buildings. We skipped the exquisite chocolates and went straight for a classic NYC Egg Cream made with the requisite Fox’s U-Bet Chocolate Syrup, milk and soda water. The Chocolate Bar has been credited with reinvigorating the egg cream after a long hiatus from the culinary repertoire of modern New York, though some would argue that the Egg Cream was doing just fine before they came along, thank you. I’d ague that an egg cream is a lower fat alternative to a milk shake and that it tastes, well… invigorating. The Italian bakery has three branches – the other two are in Italy. The glass-windowed bakery is the heart of the store and was in action when we arrived. The focaccio were deliciously fresh and reminded me of Rome. Biscotti, made with prune or figs or chocolate, were practically right out of the oven. They cut them right in front of you. I bought a box home. A NYC institution, with another store in Brooklyn. We bought sweet sausage with fennel to cook for dinner tomorrow night. Then we had rice balls – a first for me. Breaded, not fried and perfection! We stopped briefly into Murray’s Cheese Shop, newly expanded and looking disturbingly neauveau (I liked the old place better…) and snuck into Amy’s Bread for a slice of chocolate cake for later. Best baba ghanoush I’ve ever had. Eaten in Washington Square Park, just the way it should be. You can’t walk by this wonderful independent book store without stopping in. So we did. The Abingdon Square Green Market. Understandably small in winter, but still wonderful. Also not on the tour (maybe it should be?) . We stopped there on the way home, having heard so much about this store that sells – are you ready? – SALT. I picked up a tin sampler set of finishing salts – salt that’s put on food at the time you eat it, as opposed to salting your food while you cook it – and already have fallen in love with the black diamond salt. Manhattan Walking Tours offers small group guided tours around Manhattan. Thanks to Alex for a fabulous tour. Look for us on the Wall Street history tour one of these days soon! The list is nowhere near complete, but it’s what I can up with off the top of my head this week, and I plan to update it over time. Restaurants are sorted by neighborhood, and I came up with my own little key up there so folks can get a sense of what kind of place I’m recommending. Some restaurants I’ve reviewed here on the blog; most I have not (even though I have dozens of pics and the best of intentions). But let me be clear – I am not a restaurant connoisseur. I’m just an ordinary New Yorker who knows what she likes. Your tastes could differ, so you might seek better advice from one of the sources in the sidebar. If you have a fave you’d like to recommend, tell us in the comments. Annie and Marissa agreed to be my impartial tasters, and overall gave the pickles a great big thumbs up. Eat the Kosher Dills straight from the jar. Try to stop after three and leave a few for someone else. The Mustard and Spice Dills are a bit strong straight out of the bottle, but perfect for use in a sandwich. Pickles are a very low calorie food, but not zero calories as it says on the bottle. More like 8 calories for a medium (65 g) and 16 calories for a large (135 g) pickle. Horman’s NY Deli pickles are now available from Fresh Direct, which is where I’ll be getting mine. Check their website to find where you might get yours. Po is Mario Batali’s first restaurant, except it’s not Batali’s restaurant anymore. The place is owned by Steven Crane, who opened Po with Batali over 20 years ago, but the kitchen is now manned by Lee McGrath. Which is every reason you need to eat there. Mr TBTAM, my daughter and I had dinner at Po last Sunday evening to celebrate Restaurant Week and Valentine’s Weekend. We had a 5:15 pm reservation, since we had tickets for the 7 pm show at the Angelika theater . Although totally uncool, it was a great time to go – we had first sitting, great service, and by the time we left, the line was just starting to form at the door. What I loved most about Po is that it is small, intimate and feels nothing like the restaurant empire that I know Batali has built since opening Po. The only scene here is the food. The decor is simple and white, but feels warm and cozy. Steve Crane the owner was there, locals kept stopping by the bar to say hi, and it just felt like what a restaurant should be, on a street that still feels like the Village has always felt. I wanted to move there. Now. After all, Murray’s Cheese shop is right at the end of the block. So is Amys’ Breads. And Faccio’s Pork Shop. And Reafettos Pasta Shop is just around the corner. What more could a person want? White Bean Crostini. Complimentary. Fresh, garlicky, although I did sprinkle a tad of salt on mine. Mesclun greens with a lemon thyme vinaigrette. Perfect. Orichetti with sausage ragu and broccoli rabe. OMG. Reminiscent actually, of my mother in law Irene’s Bolognese, but with a robust but not overpowering thyme aroma and a butteriness that made it so satisfying, we brought leftovers home and had it the next night – even better. Grilled Guinea Hen with Pumpkin scallions, fregula & saba. Their signature dish, and I know why. Sweet, savory, light, amazing. Lingiuine Vongole with fresh clams, pancetta, red chile and white wine. Mr TBTAM, someone finally made a clam sauce as good as yours. Despite the fact that we did not have the restaurant week meal, everything was very reasonably priced. Not cheap, mind you, but it did not feel like we were being gouged in return for the privilege of eating fresh, local ingredients in an intimate setting. I like the fact that Po has maintained relationships with local food purveyors since it opened, and that they get fresh food from a farm upstate. In a way they’ve been at the vanguard of the local food movement, without being all precious (and pretentious) about it. If you’re looking for a really special meal in a really special NYC location, go to Po. I’m definitely going back again. And again. And in my next life, the one where I can afford to buy an apartment wherever I want in New York City? I’m moving to Cornelia Street. Restaurant Girl has a nice interview with Po’s owner, Steven Crane. The Frugal Foodies found the price met their means test. NYC menu girl had practically the same meal we did! Yelp reviewers give Po 4’s and 5’s. Great reviews. The Skinny Pig ate at Po in July , and has the Affogato for dessert. I’m definitely going back this summer for that. According to the Amateur Gourmet, it’s just as good as the old place. All’s right with the world again. You’re offering me $100 in restaurant coupons to blog about Seamless Web? The online restaurant delivery service that Andy turned us on to a few weeks ago? That lets me order in from pretty much any restaurant in my neighborhood by just logging and and placing my order? And the food arrives as predicted within 15-45 mins? And I don’t have to stand there with a menu by the phone getting the lady on the other end to hear me over the banging pans and shouting voices? And I discover restaurants I didn’t know existed? And it’s teamed up with Zagat so I know what I’m getting in to if I order in from a new place? And they offer 10-20% discount like the one we got from our favorite neighborhood Chinese place? We had brunch last weekend at Barney Greengrass the Sturgon King, the famed Upper West Side restaurant and fish emporium. We were shocked to find that there was no line, and they sat our group of 6 almost immediately. By contrast, the line at Popover’s Cafe, a nice enough but undistinguished place down the street, was out the door. No line at Barney Greengrass? Could it be due to the influx of Neaveau Riche to the now toney, high-rent Upper West Side? 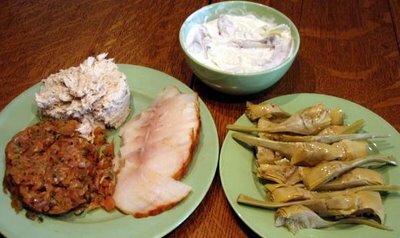 Types that don’t appreciate a good plate of Nova and eggs or a bit of creamed herring? Do they really prefer an overbaked popover to a cheese blintz, which, by the way, Mr TBTAM’s cousin Maureen declared was the closest she’d ever tasted to Aunt Eleanor’s homemade? Mr TBTAM says I’m over-reacting, and it was just that we ventured out so late that day. (It was almost 2pm). Maya first opened around the corner from us over 10 years ago. It was the first restaurant in chef Richard Sandoval’s ever-expanding empire he calls Modern Mexican. That’s a phrase that perfectly describes the food at Maya – Mexican standards that have been enlightened of fat, enriched with flavor and enlivened with new methods of cooking and presentation. Over a decade later, modern Mexican food is a new standard of its own. And Maya is still a great place to eat. But I’m digressing. Back to Maya. When we called early this afternoon, we had no problem reserving a table for 8 at 7:30 pm. Hmm…That must mean Maya is no longer a trendy restaurant destination. And that’s just fine with me. While the rest of New York is chasing the latest hot chef, I can get a table on a Saturday night and have a great meal. The service was very good, completely unobtrusive yet totally attentive. When the conversation is as interesting as tonight’s and the food, though enlightened, still Mexican, you want to take your time between courses. And we did. We sat till 11 pm, and no one rushed us or made us feel like we were taking up the table too long. I think that’s what made the evening so enjoyable – lots of time to eat, drink and enjoy the company of friends. For a First Course, Mr TBTAM and I shared the Seafood Stuffed Chile Relleno – The seafood inside was perfectly cooked, and though in a sauce and with cheese, each piece was distinctly flavored and distinguishable. Susan and Boyd had the Quesadillas, which, sadly, I forgot to taste, but Mr TBTAM tells me were fabulous. He wants to go back some evening after work just for drinks and Quesadillas. For an entree, Brenda and I had Camarones al Chipotle which is Tequila flambeed shrimp served with chile chipotle salsa and a little black bean and manchego stuffed pastry called a huarache. The shrimp was so good, I want to make it myself, and look – I found the recipe! Susan had the Lobster, which was again, perfectly cooked and served with a delightfully different creamed corn and a scallop on watercress with a chile de arbol vinaigrette. I think it was my favorite entree of the evening. Look! I found that recipe too! The rest of the entrees I did not taste, but my fellow diners raved about them all. Here’s the Tuna – Isn’t it pretty? Dessert was Budin de Tre Leches, or three-mild soaked bread puddings. And finally, Crepas de Cajetas, served with an incredible cinnamon ice cream and a candle for Susan, whose birthday was this week. Happy Birthday, Susan! Brenda and Bob, it was great to see you again and Gida and John, it was wonderful to meet you. I hope we see you all again sometime again soon. So glad you’re all here in the City and welcome to my neighborood! Guacamole Maya — Halve, pit and peel two fully ripened Mexican Hass avocados. In medium bowl combine avocados, 1 cup peeled, seeded, diced tomatoes, 1/4 cup chopped onion, 1-1/2 tablespoons chopped fresh cilantro, 1 tablespoon fresh lemon juice, 3/4 teaspoon salt, 1/4 teaspoon ground black pepper. About 2 cups. No, it’s not drugs or alcohol. It’s Gertie’s Artichoke Tapanade, and I got mine at Costco. Makes a great party appetizer served with baked pita triangles or crackers, but I’m trying to figure out how else to use it – maybe on pasta? About ten years ago, they built a Costco in Long Island City, right on the East River and across the street from the Naguchi Museum and adjacent to the Socrates Sculpture Garden. I was aghast at the use of that marvelous space to house a giant box store, and never once considered shopping there. After all, I am the quintessential New York food snob, one who worships weekly at the cheese counter at Fairway market and whose idea of an orgasmic experience is a good olive. Someone who eschews prepackaged convenience foods as if they were poison, who would rather starve (well, actually, order in) than eat what the rest of America eats. I am not an American, after all. I am a New Yorker. (That’s practically a Parisian.) And I do not shop like Americans do. You see, last weekend, at my musical theater class party, I had a piece of one of the most delicious cakes I’ve ever tasted. I was surprised to learn that it was from Costco, as were all the wonderful appetizers. That was interesting, but then I found out what Costco charges for the cakes. That was it. Like a kid being given their first hit from a schoolyard dealer, all I could think of since then was going to Costco. And yesterday, that’s what Mr. TBTAM and I did. I am still reeling from the experience, which was, in truth, a bit overwhelming in a way that I don’t yet entirely understand. About halfway through the store, at a point when our cart was filled to the brim with paper towels and toilet paper and cases of beer and diet coke, and butter and two giant Nutellas and god knows what else, I just froze. I was paralyzed and completely overwhelmed. I could buy nothing more. From that point, Mr. TBTAM and I sort of just wandered through the fresh food section, glassy-eyed, until we found our way to the check out counter, where we learned that we should have brought our own shopping bags. We paid with our debit card (they take no plastic except Amex), packed up the car and drove home. I rearranged my pantry to fit everything we bought, and now am sitting trying to understand the experience. Not unexpectedly, I have a few comments and some questions. 3. Does one shop there on some regular basis? Or is it just a one time experience, like going to Disney World or Las Vegas? I’m a little worried about going back – I’m afraid of all the money I might spend. Between the membership fee and what we bought, we spent $350 yesterday. I keep telling myself that I saved over $100, but somehow it doesn’t feel that way right now. 4. Does anyone buy the perishables? that’s a rhetorical question – I know they do, because everything looked so fresh. But how do they do it? Does everyone but me have giant freezers? Can you really use that up that many lemons (or oranges, or red peppers) before they go bad? I figured out that for families like the one in Cheaper by the Dozen, this place makes sense. But unless I was having 100 people over for dinner, I don’t know that I can really buy quantities that large for anything perishable. I could really use some advice here. It occurred to me that I might get together with my neighbors and friends and buy in bulk, then split the stuff up. If anyone does this, maybe you could give me some tips on how to do it smoothly. 5. The prices were so LOW. The shock factor on this was enormous for me. On average, prices were 50% less than what we are paying in the supermarkets. (Example – College Inn Chicken Broth – 50¢ compared with a dollar at the supermarket, and $1.29 at Fresh Direct.) How do they do it? I hope that my price is not ridiculously low because Costco’s employees wages are also ridiculously low. I would certainly be willing to pay another 25% in price if it meant a living wage for these folks. FYI, Most of the workers handing out the food samples did not speak English. 8. They do not carry nearly as much variety as Fairway does. Although my wallet was disappointed, I was relieved. I love shopping at Fairway. 9. Is it possible to stop in and buy milk and eggs, and not end up spending $300? I have this idea that we’ll run over once a week, and that once we have all the big bulk items in stock, we won’t be spending as much. Or am I just getting sucked in? 10. I want a big plasma screen TV. There’s alway a line at Russ and Daughter, but it’s well worth the time spent in the queue. Or shop early, which is what we did, to avoid the crowds. Plates of marinated artichoke hearts, smoked salmon tartare, sable, whitefish salad and herring in sour cream, served with warm bagel quarters and coffee made a delicious lunch on a recent Saturday. It’s salty fare, which made it the perfect prelude to a long afternoon spent wandering the stalls at the Union Square Green Market and St Mark’s Place in the East Village. There was no need for anyone to make a bathroom stop! We stumbled upon Black Hound tonight in the East Village, just as the snow was starting to lay. I had trouble deciding what to buy. A little cake, perhaps? That’s what my daughter got. A little fruit tart? I brought one home for my other daughter. When I get those 4 pm cravings, I usually make myself a cup of chamomile tea and tough it out till dinner. But sometimes, like today, I cave in and have a cookie and a cup of Joe. And when I want a really great cookie, I get these Raspberry Oat Bars (with chocolate chips) from a baker on Long Island called Have Your Cake, Ltd. But I don’t have to go to Long Island, because my friend Mark sells them around the corner at his deli.They are not cheap ($2.99 for 2 large cookies), but they are worth every penny. And the best part is that I only ate one, so there’s another cookie waiting in my desk drawer for tomorrow afternoon. If you want to stop by, I’ll split it with you…. We had dinner at Cafe Lalo on West 83rd St. last Saturday night. Now, I love this restaurant. It feels very Parisian, but also says “Upper West Side” to me. It was in “You’ve Got Mail”, one of my favorite movies. It’s across from the Children’s Museum of Manhattan, one of my kids’ favorite haunts when they were little. The crowd is always fun to watch, a great mix of young and old. The waitresses are really, really nice. And, I love the women’s bathroom. So, let’s talk about the food. Overall, it’s a casual menu, heavy on veggie choices, and that’s fine with me. We’ll start with the desserts, because that’s the best part. Simply, they are to die for. The breads, pastries and tarts? Equally delicious. (Great brunch place, by the way.) The drinks? Good choices. Great coffees, teas, Italian syrup drinks, wonderful spiced hot cider, and I really like their big coffee cups. Sandwiches? Excellent. (My daughter had an avocado, cheese and veggie sandwich on good bread with a nice house vinaigrette.). Interesting salads and sides, nice fish plates. My husband had a goat cheese and onion tart with a salad – it was yummy. All of which is to set you up for just how unexpectedly disappointed I was with my own dinner at Lalo that night. I ordered the cheese plate, which is presented on a separate menu card, so I assume it is a house specialty. A plate for one includes 3 cheeses that you get to select from 20 or so, a tiny glass of homemade house wine, a pressed fig, some quince jelly and bread. The cheese selections include several goat’s and sheep’s milk cheeses, which I like. First they served the blackberry wine, which was delicious and came in an interesting little wine glass, my only complaint being that the thimble-sized serving was too small. The cheese plate itself was attractive. The quince jelly and fig were really tasty. The bread was fresh and warm, and came sprinkled with spices and drizzled with olive oil. I liked that. So what was the problem? They served the cheese right out of the fridge! It totally ruined what could otherwise have been a marvelous food experience. A “buttery” cheese I selected was buttery, all right. Just like hard butter from the cooler, but worse, in that it crumbled when I cut it. The hard sheep’s milk cheeses were flavorless – no shiny drops of dew glistening on the surface, no odor to enhance the palate, just cold hard cheese. I asked the very sweet waitress to at least have the chef pop the buttery cheese in the microwave for just a sec to take off the chill. The chef refused, telling her to tell me that “cheese has to be served at 41° Fahrenheit”. (I knew he didn’t mean Celsius, because 41°C is 107°F.) The waitress apologized profusely, and I just finished my dinner, thinking that maybe I was wrong. Here’s what I think happened at Lalo. The chef was more worried about food spoilage than serving great food. It’s hard to keep cheese at the right serving temperature in a restaurant and stay ahead of the food inspectors. One has to estimate correctly the amount of cheese to be served, or keep up with the demand by moving cheese frequently out of the fridge to sit on the cutting board. Who knows, there may even be a requirement to waste uneaten cheese that has come to room temperature. I understand the dilemma, but as a diner, I have no sympathy. If you are not prepared to serve a cheese course properly, it may be best to take it off the menu. Christ, did I just write that? Somebody stop me – I’m becoming such a goddamned gastric snob… What I meant to say was that I still love Cafe Lalo, and that you should not hesitate to eat there. Just don’t order the cheese plate unless you like your Cleese (I mean cheese) served cold.